Falls are a common problem for adults age 65 and older. But there are plenty of steps you can take to reduce your risk of falling. 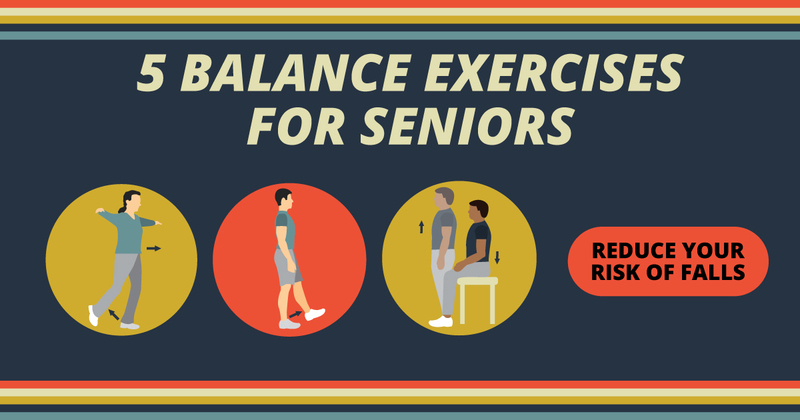 These balance exercises are a great place to start. Check with your doctor before beginning any home-exercise program. When doing the exercises, position yourself near a countertop or other sturdy surface you can hold on to for support if needed. Step sideways in one direction with your toes pointed straight ahead. Move 10 steps in one direction, then return in the other direction. As this exercise gets easier to do, try using a resistance band stretched across your legs just above the ankles. Rise out of a chair without using your arms to push yourself up. Too difficult? Place a firm pad on the chair seat to raise your sitting height as needed. Do this exercise 10 times. Hold that position for a count of eight. Slowly return your leg to the starting position. Repeat with your other leg. For an extra challenge, flex and point your lifted foot: Bend your ankle so your toes first point away from you, then flex the ankle up to point your toes toward you. Do this exercise 10 to 15 times with each leg. Raise your arms to the side until they're even with your shoulders. Focus on a spot in front of you to steady yourself as you walk. Walk with one foot in front of the other in a straight line. As you walk, lift your back leg and pause in this position before stepping forward. Do this for 20 steps. Position the heel of one foot just in front of the toes of the other foot. Your heel and toes should touch—or at least almost touch. Take a step. Put your heel just in front of the toes of your other foot. Avoid getting tripped up inside your home. Here's how to fall-proof the rooms in your house.